Antibiotic free, cage free, biodynamic, grass fed, pastured, fertilized, free range, free roaming, free roaming, free running, irradiated, natural, no hormones, no chemicals administered, pasteurized, vegetarian fed, high-Omega 3, whole grain fed. All of these labels have been used just to market eggs. In fact, eggs are the product with the most “eco labels” of all reviewed by Consumer Reports. How do you navigate the sea of label terms and find out what they really mean? 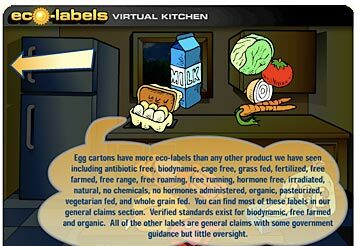 Consumer Reports offers an Eco-labels Center that has tools like a virtual kitchen that shows users common foods and the labels associated with them, some of which were new to me. Did you know wine can include a “salmon-safe” label, for example? The site also offers three different ways to search for label definitions; by “label” including label term, logo, label index and label category; by product category including food, household cleaners, personal hygiene, and wood/paper; and by certifiers, the organization or program that validates the label claim.